A storm is brewing in the Mexican state of Puebla. A new distributor road, buildings, and a pedestrian bridge are under construction only 400 meters away from the Great Pyramid of Cholula: the world’s largest pyramid by volume. Researchers and academics at Mexico’s National Institute of Anthropology and History (INAH) have condemned the work and have stated that the government of Rafael Moreno Valle, Puebla’s governor, did not consult them about the project. These archaeologists claim that the distributor road is within the monumental zone of the site and, in their expert opinion, will threaten known archaeological remains. 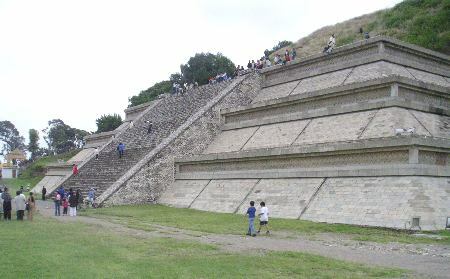 However, the government of Puebla issued a press release in early February stating that they had the relevant permissions from the INAH and that archaeologists would monitor the construction. The permissions have not yet been made public. It is quite interesting that the state government thinks that they have permission to build and the archaeologists do not. At least one journalist has allegedly seen the permission document via an unnamed source. The source claimed that the Moreno Valle government was not required to apply for a construction permit, but did anyway, producing a map that indicated that the road does not encroach on Cholula’s protected area. Construction plan at Cholula via the website of the state of Puebla. This isn’t the first controversy in Puebla. In 2012 the administration began construction of a cable car in the historic city centre of Puebla. To accomplish they partially demolished the Casa del Torno, a 17th century building that was a listed and protected historic monument, without the permission of either the city council or the INAH. The state government was rushing to build the cable car for a tourism celebration that year: it was meant to be one of the longest cable car lines in the country. The Historic Centre of Puebla is a UNESCO World Heritage Site. The courts, obviously, ordered a halt to the construction works when the Moreno Valle government couldn’t not produce an INAH permit, but the damage to the Casa del Torno was extensive. The battle over this construction lasted for a year. As of December 2013 a plan was accepted that would prevent the cable car from passing over the historic city centre. The Casa del Torno is meant to be repaired at some point. It is too soon to say who gave permission, when, why, and with what oversight, but it is easy to see why the archaeologists at the INAH are upset. The statements by this unnamed source indicate that the government fundamentally does not understand the nature of archaeological remains and that no one fully explained it to them. In a situation not unlike the construction of a Walmart at the World Heritage Site of Teotihuacan (as it turns out there was an obscene amount of corruption involved in that), the government of Puebla believes that archaeology stops at an arbitrary boundary line on the map. That just isn’t realistic. At its height, Cholula housed a population of 30k to 50k people and sprawled over 10 square kilometers. The idea that there are no archaeological remains a mere 400m from the site’s most important and prominent ceremonial building, and thus no planning permission or monitoring is required, is just not supportable. Think of it this way: the distributor road is only 400 meters from the Great Pyramid. To get a feel for how close that is, the pyramid itself measured 400 by 400 meters in its final form: the road is only a pyramid away from the pyramid. Just because you can’t see archaeological remains on the surface doesn’t mean they aren’t there. That is why we archaeologists dig. Considering development, income generation, and tourism: we aren’t talking about some remote and unpopular site here. The view is beautiful: the pyramid is topped now by a historic church and one is able to line it all up with the sometimes-smoking volcano in the background (see above). 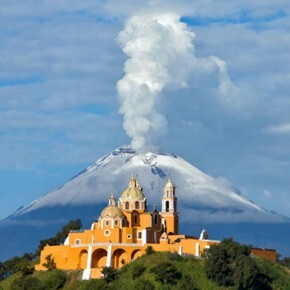 Cholula welcomed 12,396 visitors in just the first two months of 2014, an 11% increase from last year. People like to see the ‘oldest’, ‘the most mysterious’, and ‘the biggest’. Cholula has a ‘biggest’ and people pay to see it as well as spend their money on local business. Why would the government jeopardize that? I’m just not sure what the Puebla government gains from all this. Stringing a cable car through the World Heritage Site was madness: tourists come to see historic Puebla, they don’t come to ride a terrifying cable car. Putting Cholula at risk in such a way that the INAH complains to the media doesn’t make sense either. It is a situation worth watching for sure and it will be interesting to see if a permit was issued and, if it was, why a vocal wing of the INAH thought it wasn’t. Or if it wasn’t issued, who was lying and who green lighted construction. We cannot halt time, development must happen, but it must happen in a monitored and controlled way. We only get one Cholula. 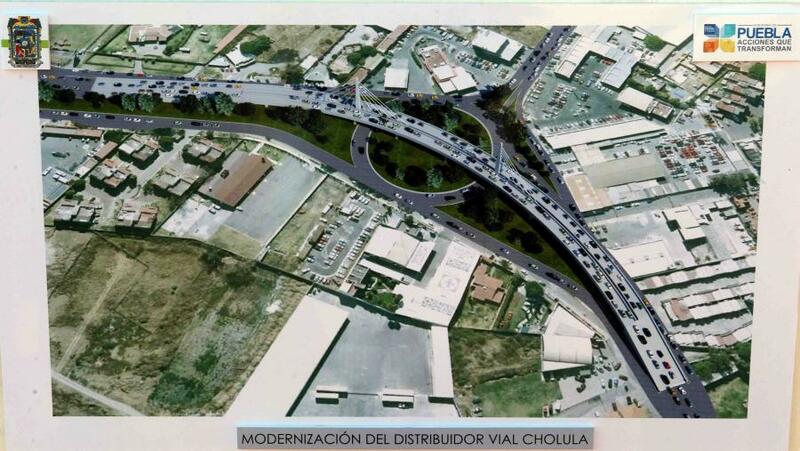 The INAH, via their delegate in Puebla Francisco Ortiz Pedraza, that the government of Rafael Moreno Valle DID NOT have final permission to begin work on a distributor road at Cholula. The document that they issued was speculative and meant to outline what the government would need to do to gain approval. The INAH wonders if the document was misinterpreted. The government of Puebla maintains that they don’t need a permit anyway because they are not building on the protected site. The INAH disagrees.